If you're anything like us, your Christmas tree is probably still decorated, your New Year's Eve plans came together at the last second, and locking down a New Year's Day brunch was an impossible dream. Regardless, you'll still need food on the first day of 2017, so when you wake up -- in a strange city, or a stranger's bed, or both -- we've got you covered. 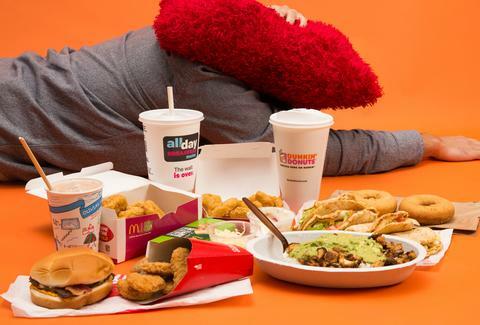 Behold our definitive guide to the best, most hangover-busting-est order you can get from these 14 major fast-food chains. According to OpenForNewYears (a very trustworthy blog that absolutely dominates SEO one week each year), each of these beloved brands have franchises doing business on New Year's Day, and according to math or something, there's almost definitely one serving near you. Figure out which, find some pants, and stumble in. Your perfect hangover-busting order awaits. Regular menus. We tried to ignore tantalizing special items, because they aren't always available. Greasiness. According to WebMD -- the also-trustworthy website you visit to convince yourself that your minor headache is actually a combination of SARS and AIDS -- grease & fat act better as a preventative hangover tactic, rather than a day-after repair move. Anecdotally, though: yep, grease'll work. Carb content. No bread, you're dead! Beat it with wheat! Eat grain, no pain! And so forth. Heartiness. Unlike the person you'll kiss at midnight tonight, these orders have substance. Absence of spice. Obviously there are exceptions based on personal taste, but by and large, we reached a consensus that mega-spicy foods were not optimal for alcohol-addled stomachs. Stay safe tonight, party hard, buy the expedited bathroom-access bracelet, then tomorrow, order one of these picks, and you're guaranteed to spend 2017 as a much wealthier, more beautiful, significantly less hungover person. If you can find an Arby's willing to make you a Meat Mountain, for God's sake, don't miss the opportunity. That's rare, though. Assuming you can't, you're going to want to snag a Beef 'n Cheddar -- with its onion roll & cheesy sauce, it's more robust than the original -- and tack on curly fries & extra sauce. Pro tip: start with a side of mozzarella sticks. It's the smart way to ease your stomach into the new year. Look, you can wake up with the King if you want. Cool Teens™ do it, when they're not too busy tweeting at Denny's, and, like, "vaping." But we recommend a very specific, very non-brekkie tack if you tied one/several/all on the night before. First, double up with two basic cheeseburgers off the value menu. Do NOT buy the double cheeseburger; you want two sandwiches. Why? Buns, man! That double dose of carbs (or whatever fast-food buns are made out of these days) will sustain your energy as you start stage two: the nuggets. 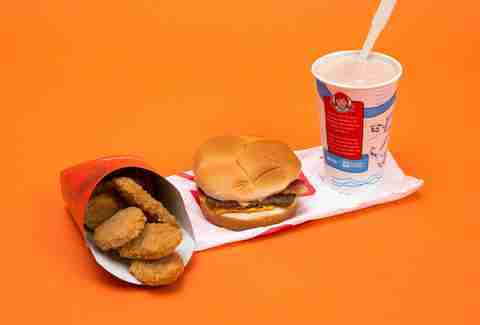 Now, the King's nuggets are solidly average on a normal day. But this is no normal day; this is the first day of the rest of your life. Or 2017. Yeah, that. And today, you will appreciate their excellent breading and one-bite density, because you'll be able to line your vodka-addled tummy with a half-score of 'em in one sitting. 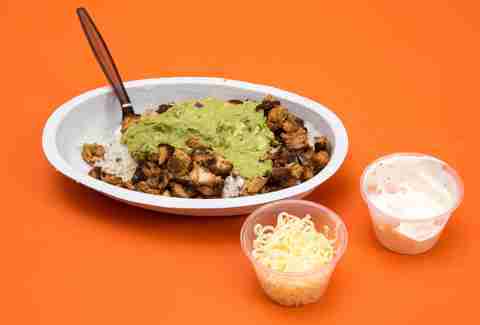 Despite being truly magnificent, it's the opinion of this hungover fast-food guide that a standard Chipotle burrito is a misstep for your substance-addled stomach. The thing is, 'Potle is healthy-ish (no grease! ), but it's still a gut-busting volume of food. That's why you're dropping the tortilla and beans; there's only so much room in there before you burst, and you need to make sure it's all occupied by either meat or carbs. Keep the dairy on the edges, and pray the heavenly angels manning the line may take pity on you and load up your bowl with extra chicken. You need the avocado, because it contains those omega-3 fatty acids to keep your heart ticking, plus potassium, and a lot of fiber so you can, you know, be rid of the night before. You need the bacon because it's got that protein, a lot of thiamin, and will elevate your mood. You need that beef because it will fill your stomach up, and tastes delicious with melted cheese on it. You need those veggies and the bun because you're trying to have a well-balanced meal here. And you need the CrissCut fries because waffle fries are the best kind of fries. Now, when you are at your weakest state, that's no time to trifle with adorable fillings, or glazes, or God forbid, DD's stomachable-but-unremarkable array of breakfast/lunch-wiches. 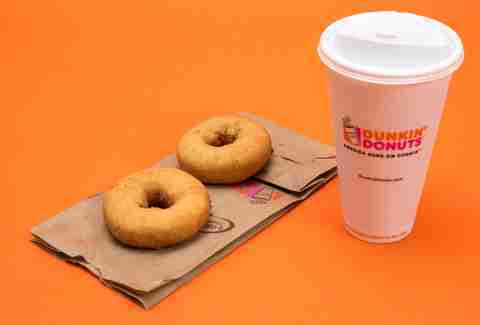 You need to stop the pain via a trio of the old-fashioned-style original donuts, preferably the ones with the handles, so you can dip them in coffee. Oh yeah, get all the coffee too. Now is also not the time to be around other humans, so settle back into your onesie to watch that movie where Hugh Grant pretends to be a modest British bookseller. Normally, we recommend all sorts of tricks with your In-N-Out. Like getting it Animal Style. Or with chopped chilies. Or with a mustard-grilled patty and extra toast on the bun. Or all of the above. But when you’re feeling like someone dropped a cartoon Acme anvil on your head, you don’t want tricks and secrets. You want the pure double burger and cheese. With an extra side of cheese on those fries. And if you’re truly looking for sublime punishment/at least one secret thing, add the Neapolitan shake too. Oh sweet lord, if you're here between 9pm and 5am, get the chicken croissant meal. It's stacked with bacon & hash browns, then covered with sauce that's actually cheese. Oh, and it comes with tacos & Halfsies -- half curly fries, half regular. 2017 is gonna be a good year. The bacon cheeseburger is very straightforward, and therefore good. Eat it. But the real star resides on the "Tacos & Sides" portion of Jack's menu. There, you'll find the apple bites with caramel dip, which are -- hahahaha, you didn't actually think we would recommend the freaking apple bites, did you?! No, you're here for the improbably satisfying tacos, specifically the Bacon Ranch Monster varietal. Much respect to anyone who draws false -- and glorious -- equivalency between "tacos" and "sides." You're probably thinking Double Down. Stop thinking that, because a) the original isn't available right now, and b) you probably didn't spend New Year's Eve in South Korea. But you definitely should double down on something: the Colonel's mashed potatoes. Dose up on spud carbs via the bowl (which also brings good grease quotient via cheese, chicken, and gravy) and a second side order. *About the tea: Your order should reflect your birthright. If you were born above the Mason-Dixon, know your limits and opt for unsweetened. Only practiced Southern stomachs raised on this saccharine marvel can handle the sweet version. Like your BK maneuver, you're looking to double down on breading here, and these two sammies are by far your best tandem on the menu. (Double up on McGriddles at your own risk; too-sweet syrup has been known to rouse taste-memories of flavored liquor, and you probably drank some of that last night. You animal!) Sprite is exceptionally refreshing and should be ordered whenever possible. The apple pie? Get some, kid. Are you sensing a theme? Nuggets, guys. 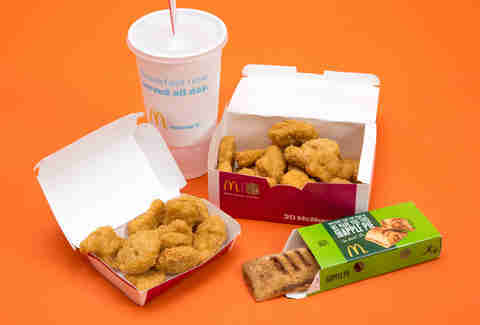 Nuggets are the answer to your New Year's Day full-body ache, and the fact is, Mickey D's makes damn crispy nuggets. To get 30 of them into your facehole, you'll need to sauce properly: we recommend barbecue, sweet & sour, or honey mustard, but you really can't go wrong. The beloved drive-in serves its entire menu all day, proving that a) it's possible; b) it's wonderful for doing it; and c) most other places making you jump through hoops to get their breakfasts are just cruel. BUT ANYWAY: this breakfast burrito is good enough to hold you down all day, which is good, because you're probably reading this from bed right now. if you're here early enough, get the A.M. Crunchwrap. Don't be a moron. Sure, it's not the most stylish order. But if you cared about style points, you wouldn't be standing shirtless in a Taco Bell covered in glitter at 1pm. Or maybe that's just us. Anyway, a heaping mountain of crescent-shaped Supreme Gorditas is your order. The spongy soft-taco shells, drenched in beef grease, form a semi-solid bond for all the toppings. This is key, because you'll get meat, cheese, tomato & sour cream in every bite. Maybe a little vomit, too. But yeah, mostly that other stuff. The thing about Uncle Dave's delicious Baconator is... well, it's a lot. It might even be too much. You were a hero last night; you don't need to be a hero this morning. The Son swaps in normal patties for Dad's quarter-pounders, so it's a bit more manageable. Again, as always, nuggets are crucial to your success, and Wendy's honey mustard is an industry leader. If your throat is sore from all those times you screamed countdowns from 10 at random moments that weren't midnight just because it was hilarious, consider the iconic shake a great soothing agent. Some days, you want artfully prepared breakfast tacos. Other days, you want Whataburger's weirdly excellent breakfast taquitos, stuffed with innards like egg, sausage, cheese, and actually decent bacon strips. New Year's Day, of course, is the latter. Don't forget the best-in-class sticky chicken biscuit, which'll deliver enough syrupy sugar to temporarily restore your energy. What you're getting later: Avocado bacon burger, Whataburger Jr.
Breakfast is served from 11pm to 11am, and they're all open 24/7, but if you somehow spend that entire 12-hour period screaming "Auld Syne Lang" at strangers in your friend's Uptown apartment building lobby, congrats: you can still get one of the surprisingly solid avocado stackers on Texas toast! Supplement with a side burger, and eat them both while reviewing the poor choices you made last night. Dave Infante is a senior writer for Thrillist, and ate New Year's Day breakfast at a Midtown Manhattan Tim Hortons once. Alone. Follow @dinfontay on Twitter, Instagram, and Snapchat.